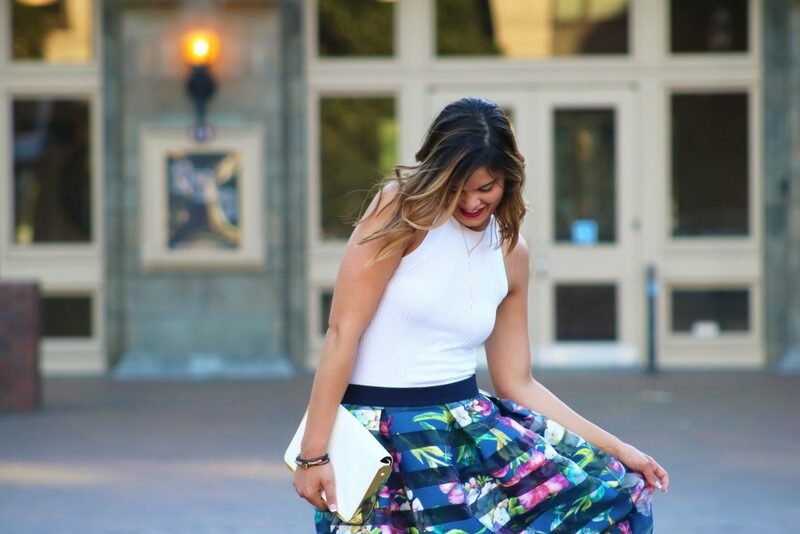 Midi skirts have easily become one of my most recent spring and summer obsessions. I love creating classic and sophisticated looks with pencil skirts, but I also find it fun to explore different styles based on my mood. 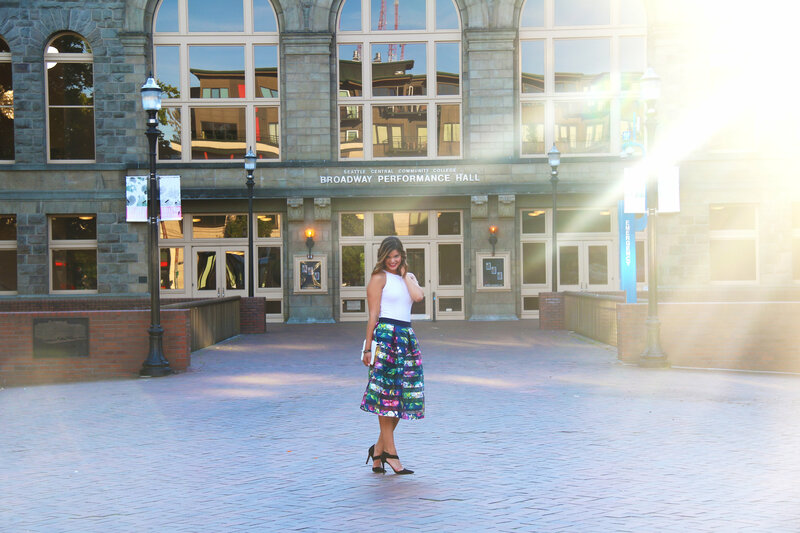 A flared midi skirt is one of those skirts that I can wear and feel instantly fun and feminine. Today I’m sharing with you five simple tips that will keep you looking and feeling your best when wearing one! There are so many beautiful ways to bring balance to an outfit. Color, texture, shape, volume, etc., Wearing a fuller midi skirt gives you the chance to balance the outfit with something more slimming on top. Choosing a tighter fitting top that you can tuck into your skirt will balance out the bottom half of your outfit. Adding a waist-cinching belt (or choosing a skirt with a defined waistband like this one) will leave your look much more polished. A midi skirt is instantly feminine, so don’t shy away from playing it up even more with other feminine aspects. Dainty jewelry, heels, or a bold lip color will keep your look fun and girly. For an added bonus go for a fun print like florals! When putting together an outfit, there are definitely so many different aspects to consider. Texture mixing is one of my favorite ways to bring dimension to an outfit. It has the ability to add variety without overdoing it. A shirt like this ribbed tank pairs well so many different fabrics and is quickly becoming a staple piece for mixing and matching in my wardrobe. To me, this is one of the biggest style savers in my wardrobe. Incorporating neutrals somewhere in your look is one of the easiest ways to look effortlessly sophisticated. Adding neutral colors will keep your look feeling classy and sophisticated. For me, this meant adding black and white with my accessories. 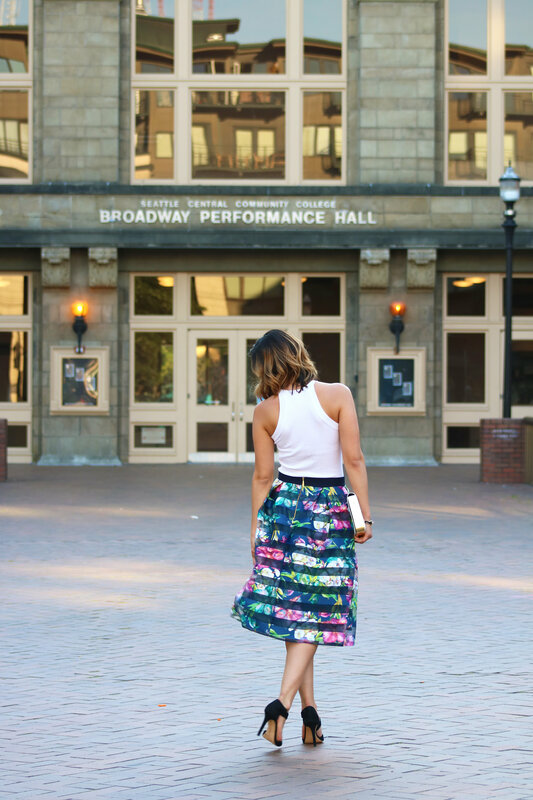 The star of the outfit (this gorgeous skirt from Closet London) still has a chance to shine! Not all midi skirts are created equal. I encourage you to play around with various lengths to fit your own body proportions. No one said you had to wear a true mid-calf length midi skirt! You can also choose fuller midi skirts or keep it sophisticated with a pencil skirt. Knowing the fit that is best for you is essential to looking and feeling your greatest. There’s no doubt that each woman is beautiful and unique in her own way regardless of what shape or size she is! Finally, I leave you with a BONUS tip and my style secret. SMILE. That’s the ultimate way you can look amazing in whatever you wear. Your confidence shines from the inside out! Have fun, smile lots, and learn to appreciate the beauty that can be found all around you. Ring: The beautiful ring I’m wearing is a keeper from my Rocksbox! Haven’t heard of them? It’s an amazing jewelry subscription service to get gorgeous gems like this! Use my code “stylemissmollyxoxo” to get your first month free. I love midi skirts! I have a white eyelit one that I don’t wear as nearly as much as I would love to. Definitely want to add more to my collection, there’s a flamingo one from JCrew I’ve had my eye one but have yet to purchase. Thanks! I have a similar white one too and LOVE it! There’s so much you can do with it! This is SO gorgeous and I love how confident you look in it! The shoes are adorable too! 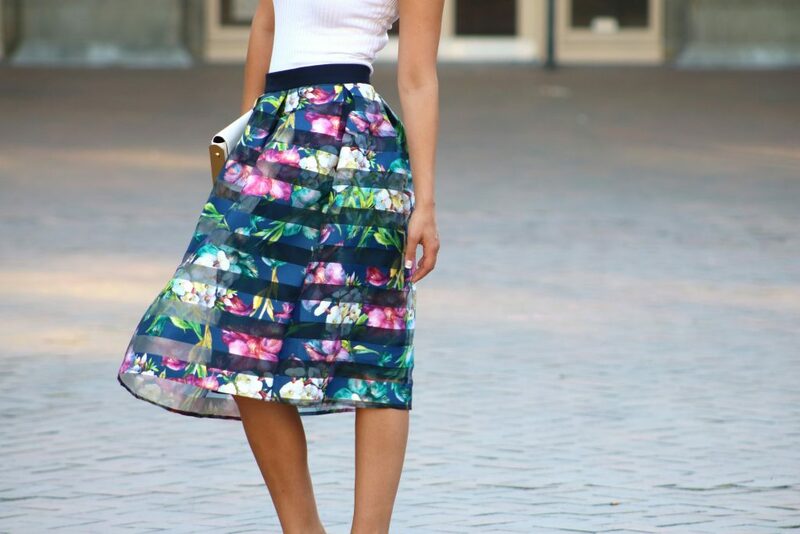 Midi skirts are to die for! Thank you so much darling! You are so kind! Awww Kait, you’re a doll! Thanks so much! Ooo… These are such great tips!!! <3 I adore your skirt! Thanks Susannah! Glad you love the tips! Have a great day!